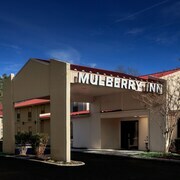 Situated in Newport News, this hotel is within 1 mi (2 km) of U.S. Army Transportation Museum and Fort Eustis. Lee Hall Mansion is 1.8 mi (2.9 km) away. A little run down/old feeling but could tell that they are trying to improve it. Security cameras all around and night guard. Very well lit at night. Breakfast was good-waffles, cereal, oatmeal, fresh fruit and yogurt. Ladies at the check in counter were very pleasant. Where to find Newport News hotels near an airport? 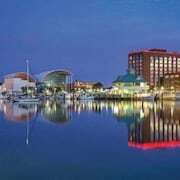 Where can I find hotels in Newport News that are near tourist attractions? 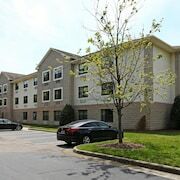 From the affordable to the more exclusive, Newport News offers plenty of quality short- and long-stay accommodation choices. Expedia lists 53 accommodation options within a 0.1-kilometre (0.06-mile) distance of central Newport News. Visitors seeking Expedia-listed hotels and accommodations close to the center of Newport News, should check out the latest deals at the Newport News Marriott at City Center and Extended Stay America - Newport News - Oyster Point. Hampton, 13 kilometres (8 miles) from the heart of Newport News, is a popular accommodation area that is home to 20 Expedia establishments. Some examples of accommodations in Hampton are the Embassy Suites Hampton Roads- Hotel, Spa & Convention Center and Hampton Bay Plaza and Suites. An alternative to Hampton, is Yorktown. This accommodation district is 17 kilometres (10 miles) from the center of Newport News. There are 7 accommodation options in Yorktown, such as the Staybridge Suites Yorktown and TownePlace Suites by Marriott Newport News Yorktown. The Virginia Living Museum and the Virginia War Museum are popular Newport News, attractions and many visitors choose to stay nearby. 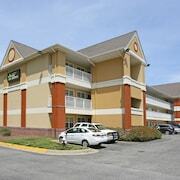 The Holiday Inn Express & Suites Newport News and the Quality Inn are amongst the options that are closest to the Virginia Living Museum. 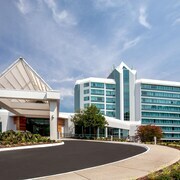 The Super 8 Newport News Jefferson and the Savannah Suites Newport News are near the Virginia War Museum. Families, students and the thrifty can select from some great Newport News hotel and apartment options that definitely won't that won't make the bank manager's jaw drop. 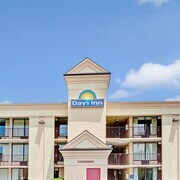 The Ambassador Inn and Suites is 8 kilometres (5 miles) from the main part of Newport News, while the Quality Inn Near Hampton Coliseum is 9 kilometres (6 miles) away. 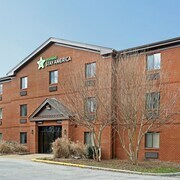 Alternative lower-cost hotels include the Super 8 Hampton VA and the Extended Stay America Hampton - Coliseum. The Great Wolf Lodge Williamsburg is 35 kilometres (23 miles) from the center of Newport News. Alternatively, the Parkside Williamsburg Resort is located 25 kilometres (14 miles) away. Two other Expedia-listed accommodation options are the Kingsmill Resort and the Colonial Gardens Bed & Breakfast. The greater Coastal Virginia area is certainly worth visiting also. Coastal Virginia offers beaches and coastal plains, and commonly visited Coastal Virginia tourist attractions include history museums. Fun-loving visitors might enjoy hiking here. Looking for things to do? Spend a few hours enjoying Chrysler Museum of Art and Norfolk Botanical Garden, in Norfolk - Virginia Beach, 35 kilometres (23 miles) to the southeast of Newport News. The Homewood Suites by Hilton Virginia Beach/Norfolk Airport and Residence Inn by Marriott Norfolk Airport are a few of the lodging options in Norfolk - Virginia Beach. 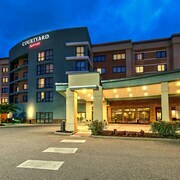 Or, you could stay in Hampton, 13 kilometres (8 miles) to the southeast of Newport News, where you'll find the Courtyard by Marriott Hampton and Crowne Plaza Hampton Marina. Should you choose to stay in Hampton, set aside some time to visit the Virginia Air and Space Center and Hampton University. If you are flying into or out of Newport News - Williamsburg International Airport and plan to stay nearby try Residence Inn Newport News Airport or Courtyard by Marriott Newport News Airport. What are the most popular Newport News hotels? Are there hotels in other cities near Newport News? What other types of accommodations are available in Newport News? Explore Newport News with Expedia.ca’s Travel Guides to find the best flights, cars, holiday packages and more!